Sacha Baron Cohen is a tour de force of comedy, managing to bring big screen laughs in everything from his own films like Borat and Bruno to the otherwise mostly depressing musical Les Miserables. One of his most unforgettable characters, however, is the small screen role that made him famous: Ali G from Da Ali G Show. Baron Cohen really got his start thanks to Ali G, and it turns out that he wasn’t a fan of impersonators back in those early days. Well, when I started out doing Ali G, nobody knew what my face looked like. So there were a number of Ali G impersonators who were going around pretending to be me. One of them gave an interview in one of the newspapers saying that if the real Ali G had slept with half as many women as he had, then he’d be a very happy man. Unfortunately at the time I was in a monogamous, very unhappy relationship, so I was particularly resentful of him. It was one thing him pretending to be me, but quite another him sleeping with my groupies. Sacha Baron Cohen’s reveal via Reddit AMA that even the greatest successes can have rather bizarre downsides paints an interesting picture of the early days of Ali G. According to the man himself, the consequences didn’t stop at an impersonator poaching the Ali G groupies. So I met another of these Ali G impersonators, and again people really thought that they were me, and this guy only did gigs with the mafia in London. So there was a really notorious family called the Krays, he did one of their funerals, and he did exclusively east end mafia gangs. I was a little bit perturbed by this and he said, 'Don’t worry, they love you. Well me. Who cares,' and that led to a few unpleasant encounters with gangland members during the beginning of Ali G who thought that they had been swindled by my Ali G impersonator. Unfortunately for Baron Cohen, what was particularly hilarious about the Ali G character also made him particularly tempting to impersonate. Few might have been bold enough to take their copycat routine to the streets of London, and it’s probably safe to say that none were nearly as funny as the man himself. 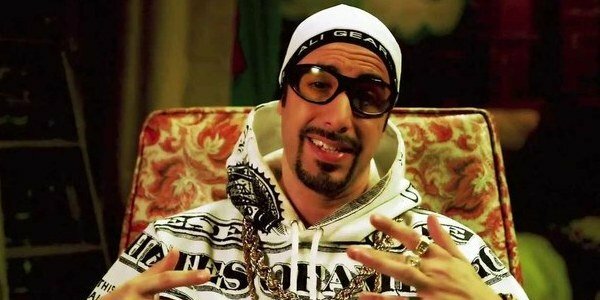 Of course, Sacha Baron Cohen didn’t exactly let his frustration with Ali G impersonators stop him from using his characters from the series to rise to fame. In the years since Da Ali G Show premiered in 2000, Baron Cohen has starred in big screen ventures about his three personas from the show. His newest film is The Brothers Grimsby, which is set to be released on March 11. He stars as one of the titular brothers, and footage is already shocking viewers based on clips alone. If The Brothers Grimsby is anything like what Sacha Baron Cohen brought to the small screen as Ali G as well as in his later works, the movie should be a major hit for those with the acquired taste for his brand of comedy.